"Hey, yo, Jim . . . This is Sylvester Stallone. Give me a call . . ."
It was these words that would set Jim Peterik on the road to rock 'n' roll immortality. After he and his Survivor bandmates recorded "Eye of the Tiger" for the Rocky III soundtrack, the song would go on to earn a Grammy, an Oscar nomination, reach triple platinum status--and become one of the most recognizable tunes in music history. 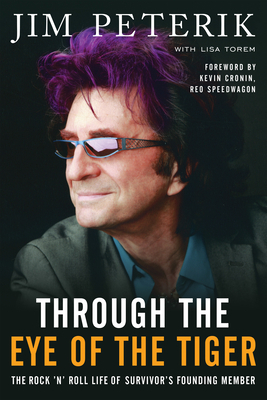 But there's much more to the story of Survivor and its founding member, Jim Peterik, than meets the eye. As one of the most prolific songwriters of his generation, Peterik has cowritten songs with some of the most famous bands and artists of our time, including 38 Special ("Caught Up in You," "Hold on Loosely"), Sammy Hagar ("Heavy Metal"), The Beach Boys, The Doobie Brothers, REO Speedwagon, Cheap Trick, and many more. Now, for the first time, Peterik is sharing his stories. Filled with tales from Peterik's life in rock 'n' roll, Through the Eye of the Tiger documents his early days of success with The Ides of March ("Vehicle"), through the often torturous power struggles within Survivor, and the giddy highs that accompany a trail of worldwide hits. From going to a party in Led Zeppelin's hotel room (and turning right back out the door) to escorting a disoriented Janis Joplin back to her hotel room after opening her show in Calgary, Peterik's accounts will surprise and delight. Through the Eye of the Tiger is more than just a memoir of a songwriting legend; it's a classic rock 'n' roll story told through the eyes of someone who has lived through it all--and through the Eye of the Tiger. What do Survivor, The Ides Of March, .38 Special, Sammy Hagar, and The Beach Boys have in common? The uncommon songwriting, vocal, and production talents of Jim Peterik. In high school, Peterik put together his first band, The Ides Of March, whose single "Vehicle" hit No. 2 on the Billboard chart. Just out of high school, the band did shows with Led Zeppelin, The Grateful Dead, Janis Joplin, and many more. In 1977, Jim founded one of the premier rock bands of the '80s: Survivor. After two critically acclaimed albums, he received a call from Sylvester Stallone to write a song for an upcoming movie. With worldwide sales now reaching 30 million, the Peterik/Sullivan-penned anthem "Eye Of The Tiger" became the title song of Rocky III and one of the most popular motivational anthems of all time. Peterik garnered 18 Top 10 hits, including "Hold On Loosely," "Caught Up In You," "Rocking Into The Night," and "Fantasy Girl." With Peterik's Songwriting for Dummies now a bestseller, he is traveling the world doing songwriting seminars. Ides Of March recently celebrated 50 years of making music together. Lisa Torem has conducted more than 100 interviews with rock personalities, but she is especially excited about the one that ultimately led to her collaboration with Jim Peterik on Through the Eye of the Tiger. Her features, profiles, and reviews have appeared in Popmatters, Windy City Times, New City, The Chicago Reader, and Pennyblackmusic, where she launched "Rock Salt Row," a debate forum, and "Raging Pages," for literary reviews. Lisa's multicultural album, Singlish, has been performed at the Chicago Cultural Center, and her one-act play, Dog Sharing was produced by Love Creek Theater, Manhattan. Her instrumental/vocal music has appeared on educational tapes and in Chicago theaters. A voting member of The Recording Academy, she lives in Chicago with her blues-harpist husband, rock 'n' roll daughters, and quartet of cats.